Valerie Bothell: MCC Squares Completed! 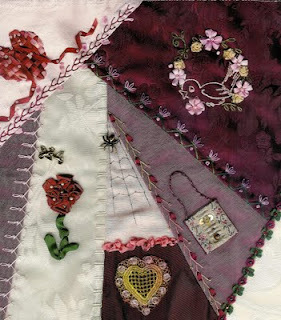 Well, we have actually completed three squares for the MCC crazy quilt that we will be donating to the MCC sale in April. I am getting a little nervous because this quilt has 14 - 10 1/2 inch squares and a large 20 by 30 inch center. I recently pieced the center and it took me about 5 hours to do! I passed it off to one of our members in the round robin on Saturday and I felt like I was giving my first born away since it took me so long to piece it! 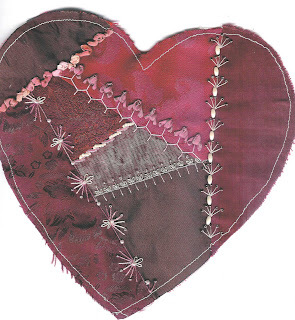 The crazy quilt heart that you see pictured is going to be appliqued to the center of the large 20 x 30 piece. I have MCC calendars for sale on my website and I would sure appreciate it if you would order one....I don't profit from them...the proceeds go to make this Valentine quilt. 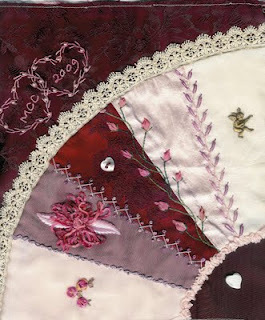 The calendars are professionally done pictures of the quilt that we did for the sale last year and are for 2010. Enjoy the eye candy..